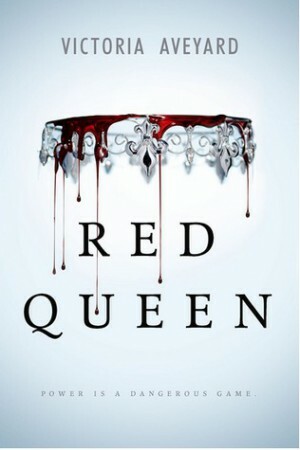 The story follows Mare Barrow, a 17-year-old girl living in poverty with the rest of her cast, those who bleed red. Red blood means that you’re a working, slaving for the better of the people in the silver blooded station above, or worse that you’re shipped off to the lines of a pointless war with another nation who has the same hierarchy based on blood. But one day sees Mare in the Silver Court as a servant, and in an accident she finds she has a dangerous power similar to those that have silver blood. Over all, the story was pretty interesting. Mare herself has no real skills of her own, at least none that she can sell like her sister’s ability to sew and embroider. Mare’s skills are more solidly in stealing, pickpocketing, and evading the police force that her little town has. But, having no marketable skill means that once she turns 18, she’ll be shipped off to the war to fight like her brothers before her. Things in her little town start off a little slow, though that’s to be expected some because the author is setting up the world, the hierarchy of the class system, and letting us know that those with silver blood, those that rule, have different powers that make them more than the red they rule over. Once we get to Court, everything picks up pace, and things are far more than they seem. As in any Court where the strong rule and the weak are usurped, no one is trust worthy, and everyone is suspect. The intrigue, growth of Mare into herself and her strange new found power is fairly believable and well written. The plot twists were just the right amount of jerky that they kept you guessing, wondering, and at the end, for me anyway, stunned because I didn’t see the final twists coming. Why then did I only give it 3.5 stars? Because there were somethings that I wish were done better. The description of the world is jarring over all. There’s electricity, there are power generators, there are televisions and cameras, even an underground tram and yet most live in simple houses, travel by boat or horseback, and short of the smaller things electricity isn’t used. So it’s in this odd not quite fantasy with no electricity but not quite dystopian either. From what I’ve heard from others that have talked to the author, it’s supposed to be expanded on and explained better in book two which comes out in 2016, but that’s a LONG way away to wait for a better description and explanation of exactly what kind of world Mare is living in. Setting wise, that should be ironed out in book one. If we live all of book one in it, we should know it. The other reason is because I found some of the names for the powers a little… trivial. You have a power that allows command over people, down to being able to wipe memories, with just a voice called Singers, which feels quite appropriate given the power. And then you have the ability called Eyes, which is the ability to see into the future. It’s like she came up with powers but didn’t want to really think on names for some of them, and they were last minute additions to just make sure they had names. It makes it feel a little sloppy to me. Over all, it’s definitely a good read, and I am curious on where book two will go when it’s finally out in a couple years. Sometimes I really don’t know where the time goes. It’s not just a fairly used expression, but reality for me. I really don’t know where my days go sometimes. For starters, I can’t believe that I haven’t been on this blog in almost a year. But at the same time, I stepped away from my work in progress for almost that long after I finished the final draft, so I guess I kind of can. I guess it’s mostly just the time passing that I don’t always catch. Wednesdays feel like Mondays, and I blink and it’s suddenly Saturday. Or I get to work at 9am, and I feel like I blink from under the pile of work I have to do and suddenly it’s time to go home. Maybe it’s because I feel like I’m sinking under more and more work and I just don’t really know how to pull myself out of it. Every second of my days seem spoken for, and not one of those seconds goes to something I have a passion for, like my writing. And my reading has fallen into a quick second behind my writing. I get home from work, and after I finally settle in for the night after dinner it’s nearly time to go to bed. I think I’m going to have a free weekend, and suddenly I have to be at an Aunt’s house for something, or a friend has an emergency that needs to be dealt with, or there’s medium work and house cleansing to do because my mom’s friend’s husband hasn’t moved on and wants to tell her something. There’s just this never ending parade of things to do. And I’m not saying I resent doing things for friends, or family, or spending time with both. That’s not what I’m saying at all. I just, I guess what I’m saying is that it’s hard. Adulting and having responsibilities and a job that takes up most of the day is hard. I know it’s supposed to be, it wouldn’t be life if it wasn’t. But sometimes I wish that I could find a better handle on managing my time, and being able to fit everything in that I both want and need to without feeling like I’m dropping something on the other end. Some people would say make a schedule, and stick to it, but well, I’m just not that organized. And I’m not exactly the kind of person that can follow a strict schedule. The minute reading my To-Be-Read pile feels like work, or editing my novel (or working on a few WIPs I have on the back burner) feels like work, I lose a lot of my motivation. My creative switch gets flipped and the lights go dark and I spend more time just staring at the screen, or piece of paper than I do actually reading or writing or working. Maybe it’s because I really haven’t had a break in over a year, and I know some of that not getting a break is because Mom and I have a LOT of things on our plate. We never really found a balance after dad died, and we’re just kind of moving day to day as we can. And the one ‘vacation’ my mom and I take isn’t really a vacation because it’s a festival that I run and coordinate, and while I do enjoy it it’s not just a vacation – it’s work too. Here’s hoping that I can work out something. I was able to finish The Red Queen, the first book I’ve really been able to finish in at least two months. I also finished editing chapter 1 of my roughly drafted novel. I’m hoping I can keep up the momentum, continue reading, continue editing, and hopefully get the short story I have in my head out and onto paper. Though the short needs to be a little more planned out before I can really get my teeth into the meat of the story, because it’s a mystery and I want to make sure it isn’t given away too soon into the book.